Option to add on a Re:vider and Boveda pack at a discount when you purchase a Runtz Jar. By now the outdoor harvest season has peaked, and cultivators big and small must face their next logistical hurdle: where do I put all this cannabis? Whether you’ve got a few extra grams or a few extra pounds, you want to make sure this year’s harvest lasts through the winter, and that it smokes like euphoric THC, not degraded, sleepy CBN. Just when you thought you’d run out of room for this fall, the custom storing jar company Mason-re and bud refrigerator company Curidor release a new collaboration, the Curidor Re:stash jar. A child-resistant lid made partially from repurposed hemp and farm waste. The storage jar comes in three sizes: four ounce, eight ounce and 16 ounce, each $20 a pop. These are in fluid ounces, so only a single ounce of cannabis flowers fits in the largest jar. The smallest jar holds a quarter-ounce. The Mason-re website currently only offers the eight ounce jar, but all three sizes can be purchased on Curidor’s site. 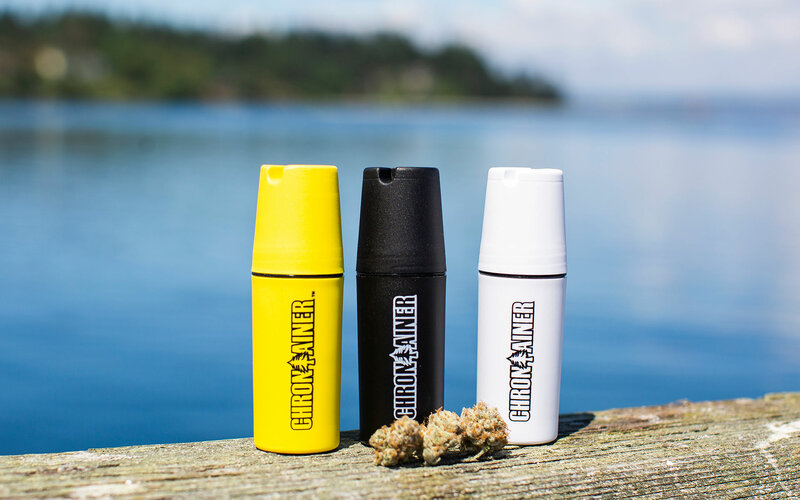 Curidor also offers a six-pack special for $99 with two of each size jar, which holds up to 3.5 ounces of dried cannabis, or cannabutter, or jams. What sets this one apart from the 2018 wave of Re:stash collaborations is an interactive design. 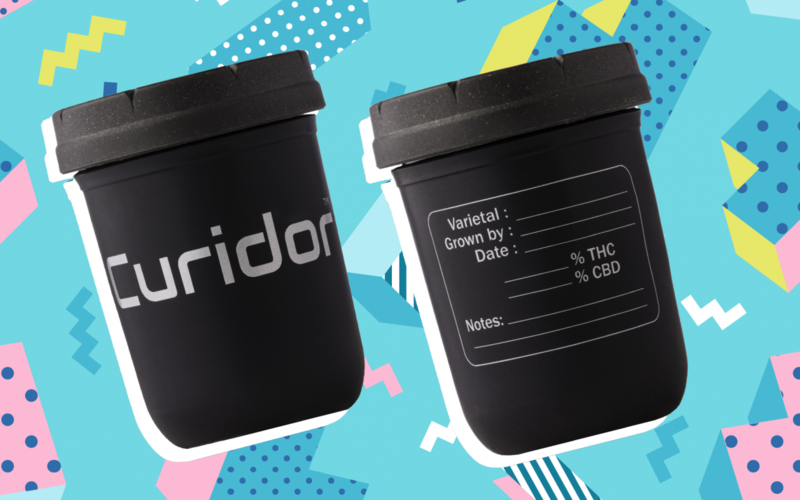 On the back of the jar, opposite the large Curidor logo, is a Sharpie-friendly label to write in the “varietal”, the grower, harvest date, THC and CBD percentages, and even a couple lines for additional notes, like “fire!” or “boof!” The Sharpie comes off with rubbing alcohol or water. According to the Curidor website, the kiddie-proof lid also provides an “air and moisture-tight seal.” As we have mentioned before, air and moisture exposure hurt the good stuff in cannabis—the cannabinoids and terpenes. Too much heat and humidity can also lead to mold, mildew and brittle trichomes. The silicone koozie not only helps regulate temperature, but prevents accidental glass jar breakage. No one wants glass in their grass. Curidor’s customer base skew toward cannabis industry professionals, but new cannabis lovers also like trendy gear, Sullivan said. What’s your favorite harvest storage option? Comment below. Get your Curidor Re:stash jar here! 7ACRES is at the forefront of Canada's historic national marijuana legalization. They have been with the movement since the beginning and are now leaders committed to pushing the entire industry forward. 7ACRES uses a state-of-the-art hybrid growing facility, combining the best of indoor with supplemental sunlight and careful cultivation practices to grow high-quality cannabis at scale. They take pride in growing high end cannabis that respects the plants' genetic lineage and history. Their sole focus is to provide enthusiasts with cannabis crafted by knowledgeable cannabis minds, who share a passion for the product; from seed, to package (like their custom Re:stash jars). Get your 7ACRES Re:stash jar here! Re:stash is a sustainable, eco-friendly container to store your favorite 7ACRES strain. This fresh take on the classic mason jar is completely plastic-free, wrapped in a matte-black slip-free 100% silicone sleeve emblazoned with the RESPECT THE PLANT tag and the 7ACRES logo. The glass construction keeps your flower fresh and its flavor untainted. The lid is constructed from recycled materials. Our new 'The Plug' Re:stash jar just dropped! The Plug is one of the top cannabis clubs in Barcelona. It stocks a wide range of unique and high-grade strains that can't be found anywhere else in the city. They recently won a Spannabis Champions Cup award for their homegrown Sativa, amidst a slew of competition in the city. The Plug also carries strains from DNA Genetics, Karma Genetics and Team 10 Extracts, along with some limited batches from local top growers. The menu changes frequently, so guests can try something new on each visit. The Plug also sells a variety of unique merchandise, including clothing and cannabis accessories, including stash jars. Check out their online store here. The club is located in the residential El Poble Sec area of west Barcelona. It's very popular with the locals due to its location along with the high quality of their strains. It can be difficult to get membership there, but knowing someone who is a member makes it easier. The club is spread over a few floors and is very similar to the clubs in Amsterdam. Summertime is heating up and sandy shores are booming with outdoor tokers and sun worshippers. Are you gearing up for a lakeside BBQ or planning a trip to the tropics? 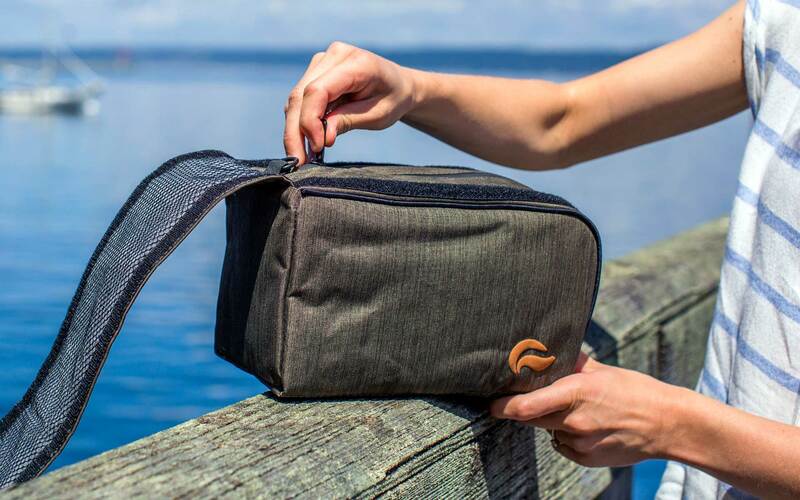 Then you’ll want a stash bag that will protect your favorite cannabis products and keep your buds from a waterlog disaster. 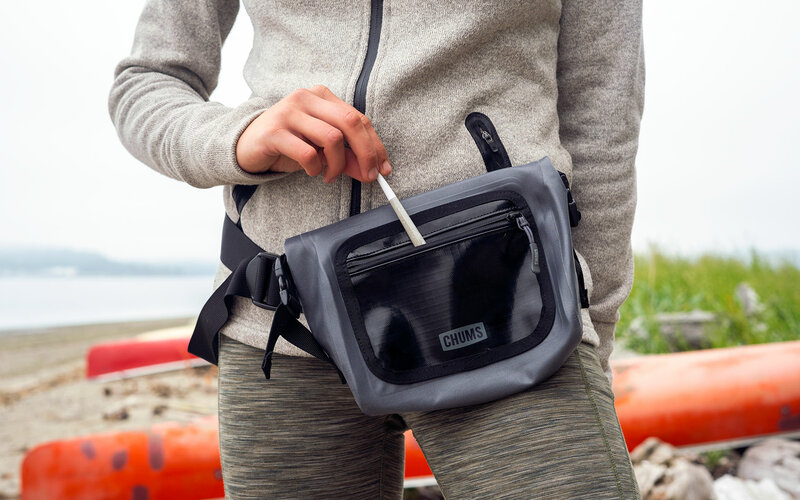 Carry all your stoney essentials the next time you head to the beach and keep those buds safe and dry. 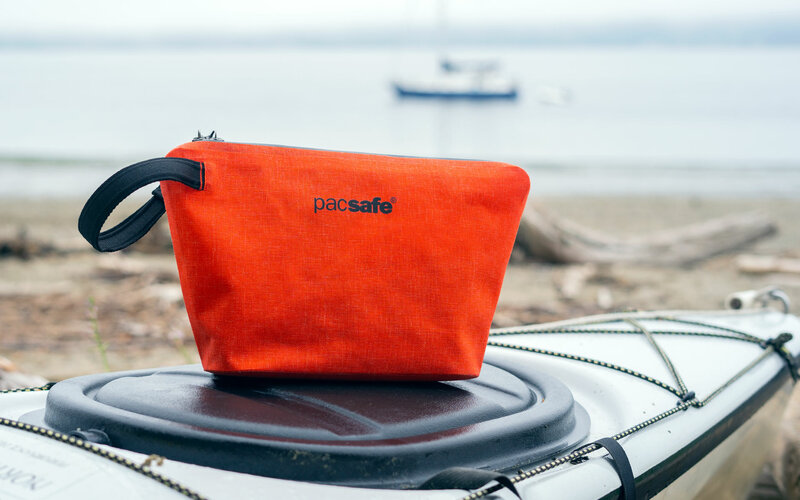 Go ahead and pack your favorite bong in PacSafe’s water-resistent Dry Anti-Theft Stash Bag. It’s large enough to carry all your gear while keeping the items inside safe and dry, making it the perfect travel companion in any situation. A nod to the classic plastic baggie, the Aqua Storage Bag by Stasher isn’t exactly a stash bag in the traditional sense—but it will keep your gear bone-dry. Bonus: it’s environmentally friendly since you only need one, saving you the use of hundreds of individual Ziploc bags. Jet-setting to Bora Bora? Don’t forget to nab the Poppins by Van der Pop. Whether or not you’re planning a lavish vacation, this water-resistant bag with a waterproof zipper is dripping in style. Made in Italy with genuine leather, keep your vape pens and grams concealed and dry. Grab a weedy pool float and take your stash to the river. Don’t worry, the eponymous Chrontainer will keep your supply dry even if it’s dropped in the water. These little stash bags are also smell-proof, which means you can be discreet wherever you go. 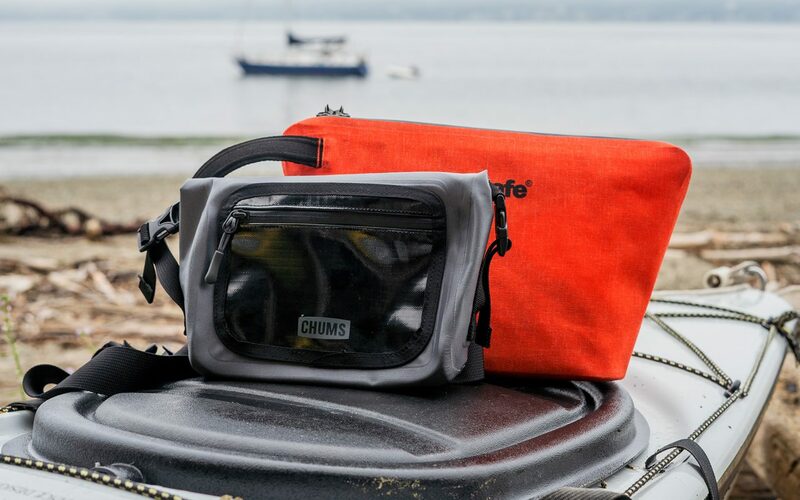 Fold, roll, zip, and clasp, the Downstream bag by Chums is a must when heading to the great outdoors. 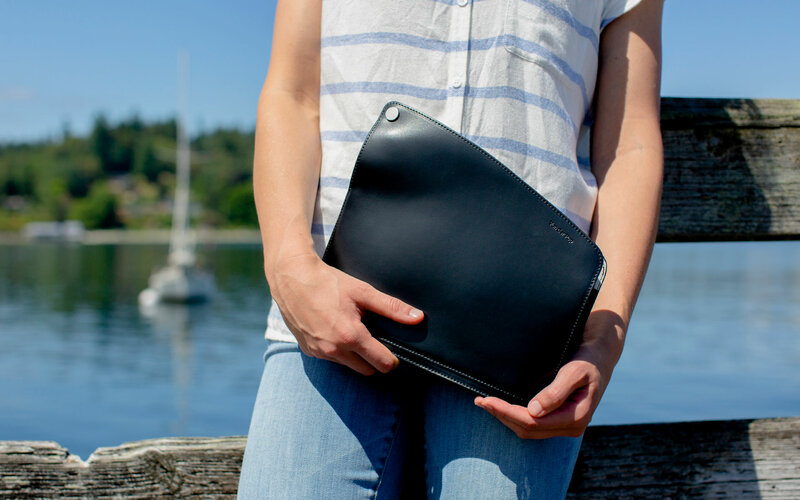 It can even withstand a “quick dunking” in just-in-case scenarios with a water-resistant front pocket and welded seams. Cut out odors and imminent weather with the Travel Pro case by Skunk. Pack up your nugs, small bong, a few vapes, and some edibles for a day of hiking along a creek or getting caught in a rain-soaked walk—everything will remain dry and protected. Child-resistant and waterproof, the Re:stash Jar by Re:stash covers all the bases. The silicone koozie wrapped around each 8oz jar acts as a sun barrier, so your go-to strain won’t experience dryness or water damage. 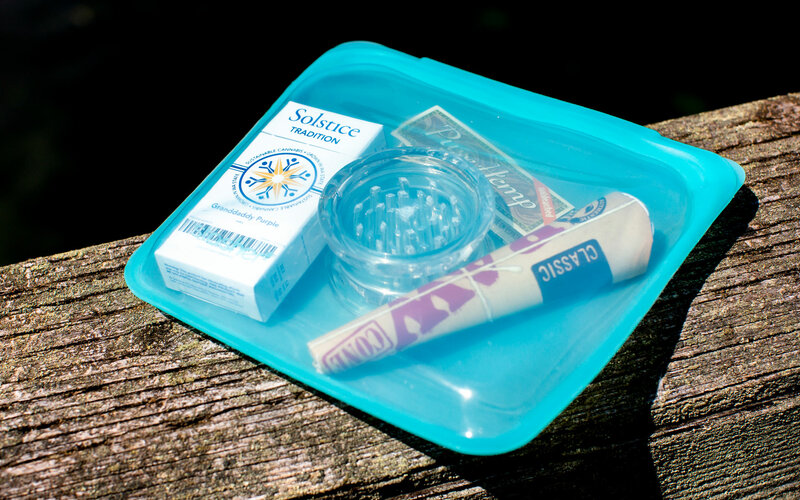 Take this “stash bag” to the beach and spark one up as you de-stress in the waves. Our Push Trees collab just dropped! Available in 8oz and 4oz sizes. Push Trees, created by Stoner Dottie and Dope as Yola, was started from an Instagram post. While Stoner Dottie and Dope as Yola were in their front yard smoking a joint, they thought it would be funny to take a picture pushing their tree. For those of you that don't know, push means to sell, and trees is a slang term for cannabis. So to Push Trees is just a funny way to say "sell weed." Stoner Dottie and Dope as Yola are known in the marijuana community for making videos and taking pictures involving marijuana. So after posting the image on their Instagram pages, they received hundreds of comments saying "make this a shirt" "please turn this into a logo" etc. And they did. Read the full story here. In Dope as Yola's words, "@unknownprophet @barbequebiz and I once dropped and broke a mason jar of weed while checking into a hotel.... if we had [Re:Stash jars] that wouldn’t of happened 😂😂😂😂😂 These things are seriously dope, keep your weed fresh and avoid terrible situations like that." Any stores interested in wholesale, contact adrian@mason-re.com. Finding your ideal strain of marijuana is essential to the experience. Each variety has its own set of nuances and user effects, so researching what works for you is worth the effort. However, if you’re still storing your bud of choice in the same old Ziploc plastic baggies, you’re doing it mighty wrong. Plastic bags can damage the quality of the flower, leaving you with a much less potent supply than you originally started with. With the cannabis industry on the rise, the need for smarter storing methods has risen too. Mason jars are one solution to the plastic bag problem. You probably know these ubiquitous containers for their wide range of uses: drinkware, canning, decor, food storage, etc. These versatile, nearly air-tight sealed glass jars are practically tailor-made for keeping cannabis in pristine condition. Glass contains the terpenes of the bud far more effectively, while also preventing the chemical transference into the bud itself that comes from plastic containers. The quality of your flower will be better maintained in a glass jar. The team at Re:stash recognizes the power of the mason jar. Started by University of Oregon graduates Eric Harvey, Nicole Harvey and Adrian Kimberley, Re:stash’s parent company Mason-re began as a to-go coffee cup manufacturer that used the jars as a selling point. Originally, the venture was funded by Kickstarter. Their initial goal was to raise $8,000, which they significantly overshot—to the tune of $17,000. Unlike many student-created Kickstarter projects, this launching point allowed the business to take off. Berner, a San Francisco-based rapper and entrepreneur, saw promise in the new company and became their first investor. As one of the parties responsible for introducing the popular Girl Scout Cookies strain to the dispensary market, Berner had connections in the cannabis industry that helped the Harveys and Kimberley further cement their place as a premiere bud storage manufacturer. Now, the company integrates the mason jar into their line of cannabis storage products. 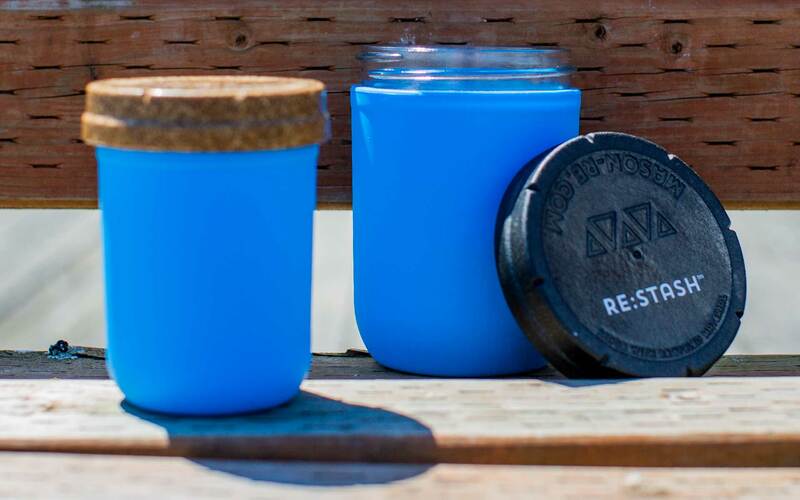 According to Kimberley, who serves as the Chief Operating Officer of Mason-re, the idea for the Re:stash product line came when they noticed how popular mason jars had become for storing cannabis. The Re:stash line now ranks among their most popular products. “People like the fact that someone is finally doing it right,” Kimberley said. The use of “re” in the Mason-re and Re:stash brand stands for reducing, reusing and recycling. Based in Bend, the company’s philosophy is to promote sustainability. Their mason jars are meant to be reused beyond their initial purpose. Re:stash jars are more sustainable than the environmentally damaging, single-use plastic tubs that most dispensaries use to sell their product. Additionally, every Re:stash lid uses their own patented design. The flax-filled polypropylene lids are made with biological waste product to replace traditional materials that would take energy to mine and produce, thus reducing their carbon footprint. This reduction of plastic waste is a major part of what drives the Re:stash business model. Additionally, the lids are designed to be child-proof, so you won’t have to worry about any young ones getting their hands on your supply. Re:stash jars improve marijuana storage in a variety of ways. With size options ranging from 4 to 16 ounce jars (which can hold an entire ounce of cannabis), Re:stash has the right jar for any user. The first thing you’ll notice about the jars is the 100% premium silicone koozie that wraps around the outside of the glass. Opaquely colored, the koozies prevent damage from excessive light exposure. With an array of colors and designs, there’s a koozie to match anyone’s preferred aesthetic. These koozies stop the temperature inside the jar from fluctuating. Since bud is best stored in a cool, dry place, the Re:stash koozie will help preserve the flower quality no matter where it’s stored. If you have a tendency for clumsiness, the Re:stash koozie also prevents breaks from dropping. Additionally, the koozie helps to prevent the growth of mildew and mold on your product. Re:stash isn’t the only company to make use of glass packaging. At Frequent Vibrationz, hand-picked buds stay sealed in glass containers to keep them fresh. Like Re:stash, Frequent Vibrationz strives to maintain a commitment to environmental sustainability. Their glass jars can be returned in-store after every 10 flower purchases for a 10% discount. Fewer plastic containers from dispensaries ending up in landfills will help you reduce your carbon footprint while enjoying your favorite strain. Re:stash products can be found at Re-Stash.com, with additional mason jar products by Mason-re at Mason-Re.com. Frequent Vibrationz (541-505-9671) is located at 1409 Oak St. in Eugene. They’re open Monday through Saturday from 10 a.m. to 8 p.m. and Sunday from 10 a.m. to 7 p.m.